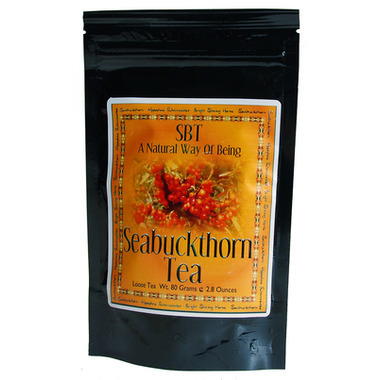 Please Note: SBT Seabuckthorn has updated their packaging! The product remains the same, but you may receive either of the above shown packages while we update our stock. SBT Seabuckthorn Tea is made from the highest quality Seabuckthorn Leaves available that are picked by hand in the wild at the height of nutritional potency. 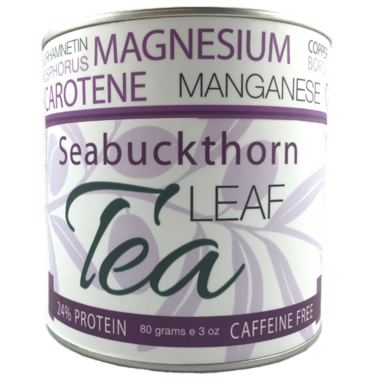 Our seabuckthorn tea is 24% protein and is rich in anti-oxidants, flavonoids, magnesium, calcium, potassium, & amino acids. It is a potent anti-inflammatory that supports heart, skin, mobility, digestive, and liver health and helps to add more vitamins & minerals into your diet. It reduces oxidative stress, boosts energy naturally & without caffeine (by increasing blood circulation), boosts collagen, fights bacterial infections, provides seasonal allergy relief, and detoxes the body. Recent studies have also found that seabuckthorn leaves are beneficial in the treatment of colitis & other inflammatory bowel conditions. Directions: For maximum results, SBT Seabuckthorn Tea is best infused to protect the more delicate oils from evaporating. To make an infusion, place the loose tea or bag in a warmed tea pot. Gently pour fresh, boiling water over the tea and cover to prevent evaporation. Steep for 10-15 minutes, and if necessary strain. In general, use one tea bag or one heaping teaspoon of loose leaf per four cups of water. Ingredients: Hand picked dried sea buckthorn leaves (from wild crafted sea buckthorn). I love SBT tea. It truly makes me feel good from the inside to the outside. My skin feels better, smoother and my liver is always healthier since I've been drinking it. I usually steep it the nite before and drink it cool the next day, its refreshing to wake up and drink. Equally nice before bed, steeped hot. I add honey. You can also dry the used leaves and add to your smoothie for additional nutrients. 100% recommend SBT. Love this tea. I use to take the capsules but they were to expensive, the tea is expensive too but I love to indulge with a nice cup of tea in the evening. It really helps my nails from chipping, and my fibromyalgia. I mix this tea with other teas. I like the taste, you do not need a lot. I was not expecting to enjoy the flavour of this tea as much as I do, and agree with the product comment that it is good as both a hot tea and a cold tea. It is expensive so it is much more economical to purchase the loose tea than the teabags. I LOVE THIS TEA!!! my one complaint is that it is so fine. I love this tea. It is a unique taste. You can put as much as you want in a cup. My only problem is the price. I would buy it again but not too often. I expected tea leaves but this is a bag of tiny bits of tea fannings... unless you have tea bags to pour this into, I wouldn't recommend buying it. The flavour and aroma are unusual but very nice. I like that it comes as loose tea - you don't need much to make a nice cuppa. Best of all its caffeine free so I can enjoy it in the evening when I am winding down for the day. It has a unique yet tasty taste and I feel great after drinking it. This tea us soothing and delicious. Just love it.